We’re in countdown mode for our upcoming vacation to Cancun – bring it on, sunshine! While we’ve had glimpses of spring here in Michigan, today…we have snow. We’re hoping to see above 40 by next weekend, but unlike daylight savings, spring is not yet upon us. And much to my mother’s dismay, we’re going to be gone over Easter – her favorite holiday, which also happens to be her birthday this year. She’d love nothing more than to be together with my girls in some darling little Easter dresses. But, CANCUN. We’ll have a belated celebration, mama. One thing Mark and I usually talk about on vacation is our garden plans. We don’t live on a lot of property and so our little raised bed garden must be planned appropriately. I’ve still got potatoes from last year…which I should really use, except the skins turned rather rough and they’re not quite big enough to peel. I told him potatoes would be “wasted” space in the garden, but admittedly, it’s fun to dig something up come fall that you’d all but forgotten about. I’m insistent on growing winter squash again – it mostly just sprawled across our lawn and created one heck of a contraption to mow around. But the yield was fantastic. We definitely learned that bigger is not always best and that butternut squash can lose flavor if they get too big. We also grow tomatoes because they’re so versatile. I always ask for heirloom varieties and he’s always buying the first variety he runs across. I’ve got to change that for this year because I’m eerily obsessed with heirloom tomatoes and their beauty. We’ll also grow zucchini because it grows SO well and is also quite versatile. As for a new something, I’m thinking of suggesting kale. 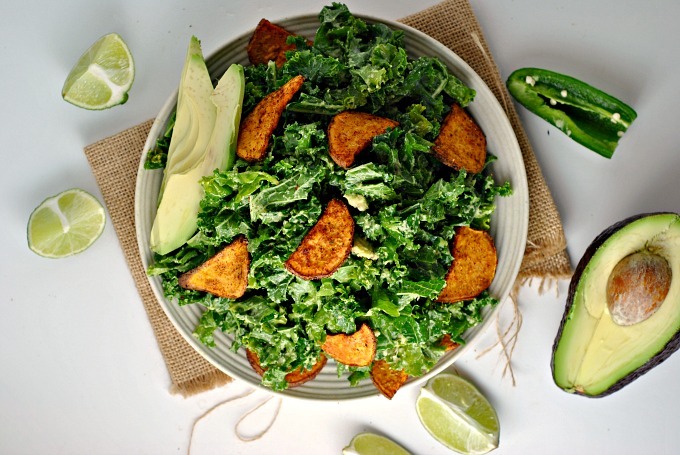 I’ve really been on a kale kick lately, obsessed with kale salads. My next endeavor will be creating the kale Caesar I had last weekend. It was loaded with Parmesan cheese and it was delicious. 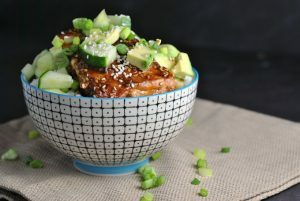 Also a recipe worth creating? 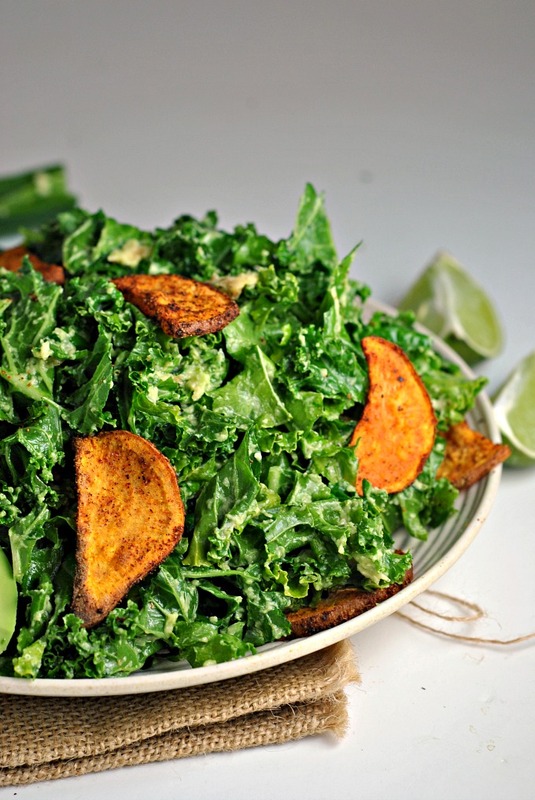 This Kale, Sweet Potato, and Avocado Salad. It’s sweet, savory, tart…while also being tender and crunchy. Blue Apron also added pepitas but I went without – the crunch from the roasted sweet potatoes was enough for me with those perfectly browned edges. So very yum! Preheat oven to 450 degrees F. Line 2 baking sheets with parchment paper and set aside. In a small bowl, mix together the paprika, chili powder, garlic powder, cumin, oregano, pepper, and half the salt until well-combined. In a ziplock bag, combine the sweet potatoes and olive oil; seal bag and toss well to coat. Add the seasoning mixture, seal bag and toss again to coat potatoes evenly with spice mixture. Arrange on the two baking sheets in a single layer. Bake for 20-22 minutes, flipping halfway through. Meanwhile, combine the garlic and ½ an avocado in a small bowl. Mash the avocado against the sides of the bowl using the backside of a fork until few small lumps remain. Stir in 1 teaspoon of lime zest and clementine zest, as well as 1 tablespoon of lime juice and 2 tablespoons of clementine juice, along with the jalapeno and remaining salt. Taste and add additional lime or clementine juice, if desired. 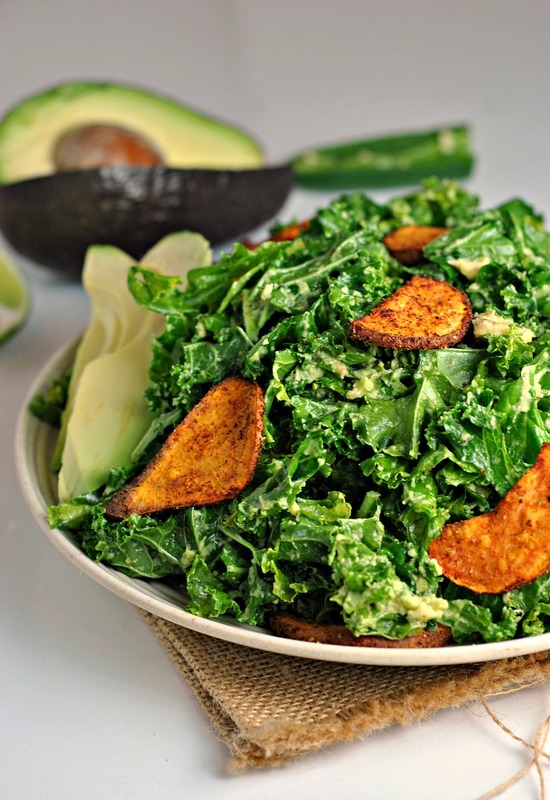 Place prepared kale in a large bowl and top with the avocado mixture. 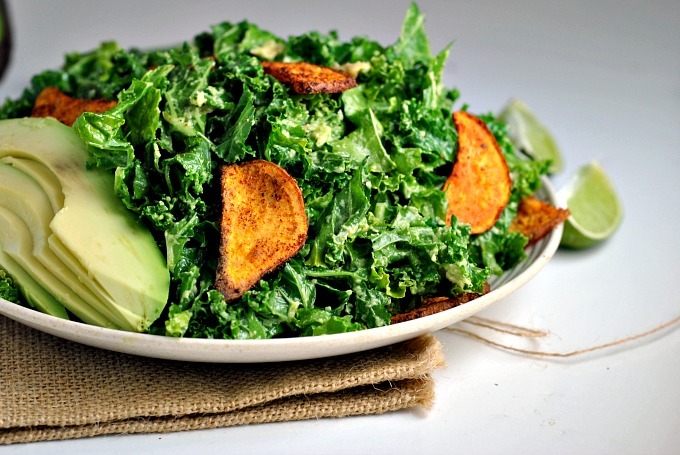 Use your hands to massage the dressing into the kale. 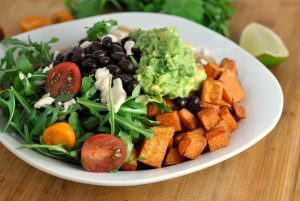 Serve topped with the sweet potatoes and remaining 1 ½ avocado. This is healthy and delicious at one time, I try this whenever I want to eat healthy and tasty it taste so good. Thanks for this recipe.